A classic comfort food gets a fun seasonal twist. 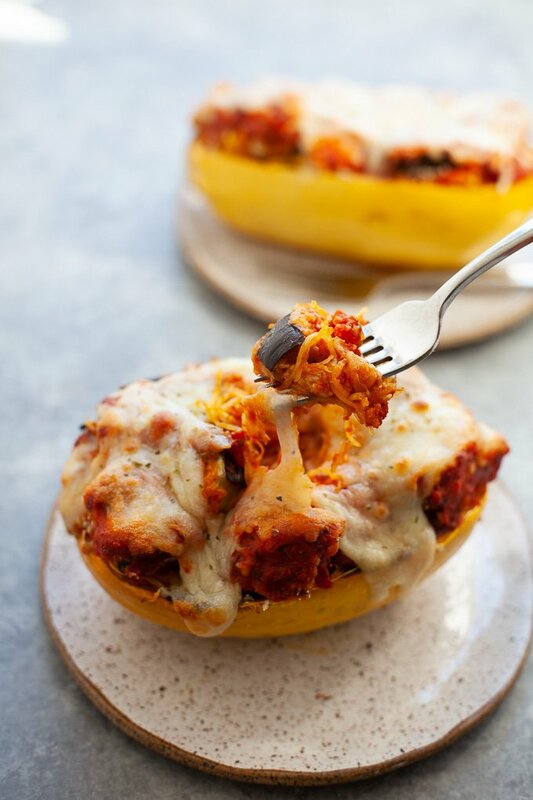 Eggplant parmesan spaghetti squash boats make for a hearty, cheesy, delicious dinner. I’m totally an Italian girl at heart when it comes to food. My dying meal involves red sauce and pasta (and a glass bottle of Montepulciano). ‘Nough said. 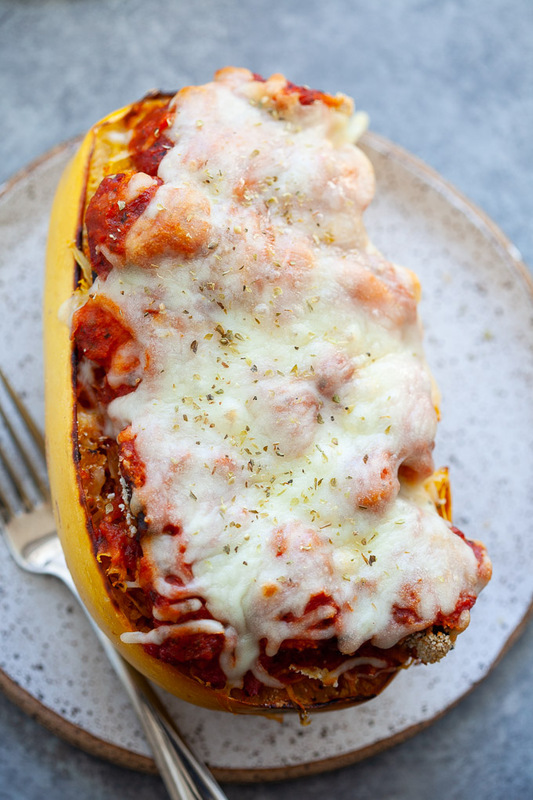 Eggplant parmesan is by far one of my favorite comfort food meals. Breaded, crispy on the outside, soft on the inside eggplant smothered with tomato sauce and melted cheese. What’s not to love? 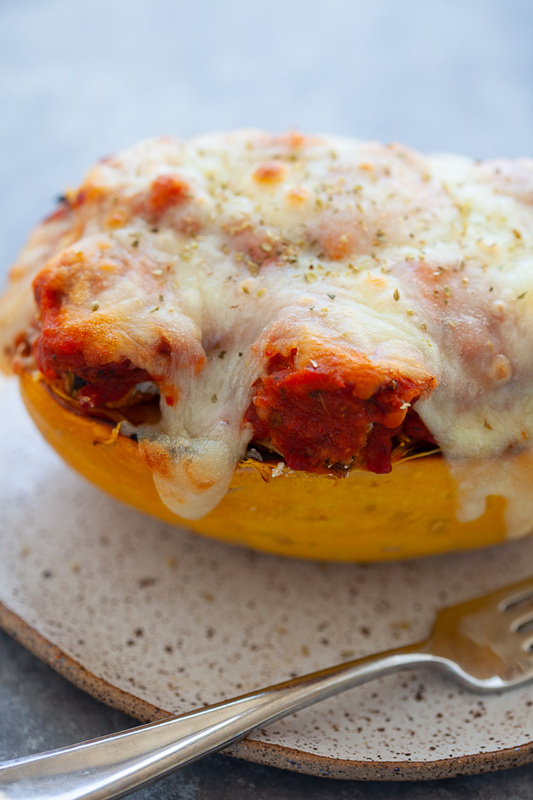 Since squash is in-season this time of year, I decided to top spaghetti squash with all the eggplant parm goodness. Because spaghetti is in its name so it works right? 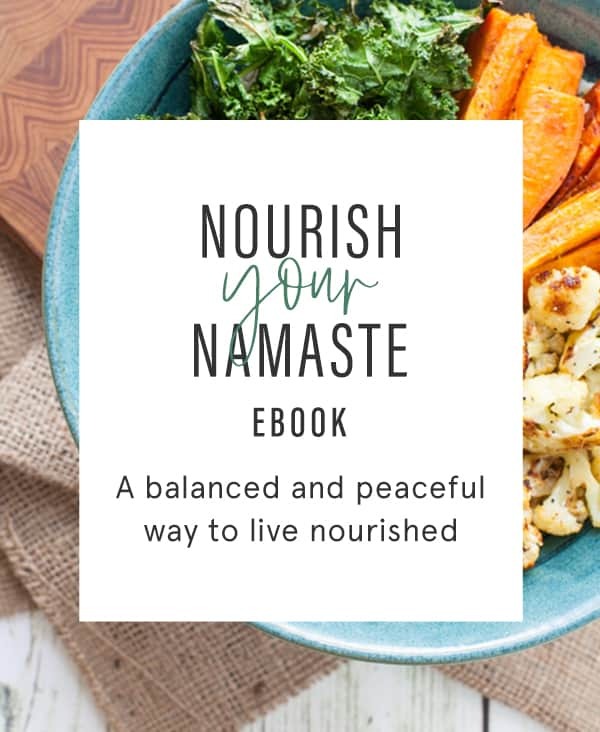 Plus it packs in heart-healthy and immune-boosting nutrients like potassium, folic acid, vitamin A, and beta-carotene. 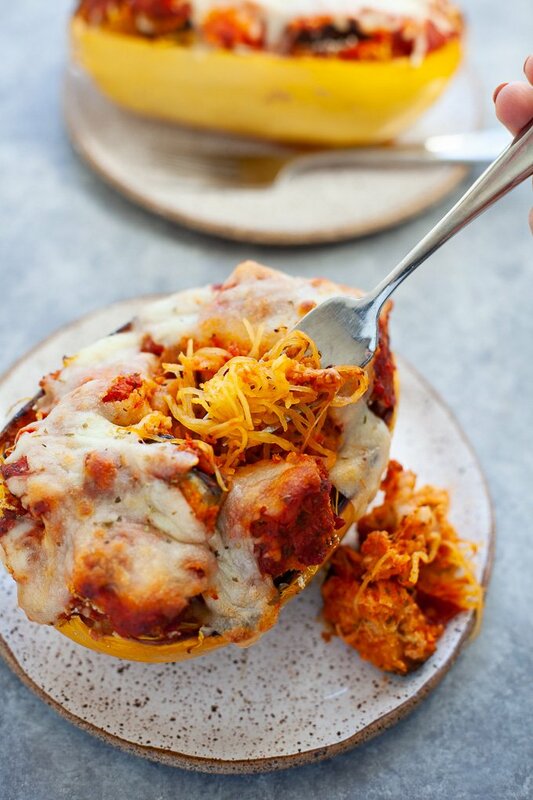 But mainly because shredding the squash into strands with a fork is quite possibly one of my favorite culinary pastimes (this is why I also have a recipe for vegetarian enchilada spaghetti squash boats). It’s fun. Trust me. This meal is pretty straight forward. You roast the squash. Bread some eggplant. And layer your squash boats. Voila. And the outcome is delightful. I love how hearty and satisfying this meal is. Perfect for winter time hibernation mode ;). Even Steve enjoyed it and he’s not the biggest winter squash fan. The Italian in me is jumping up and down for joy. 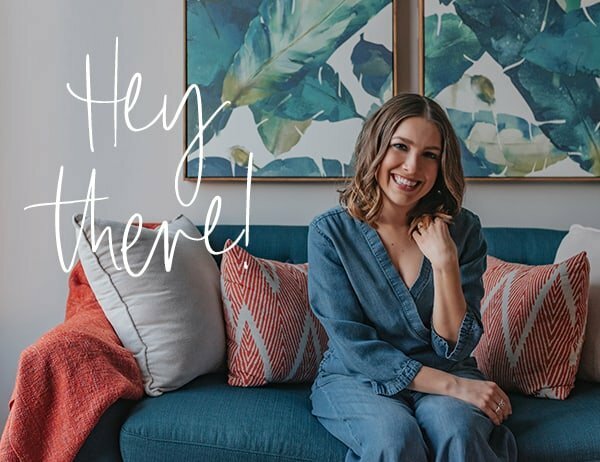 This dish is vegetarian-friendly and perfect for Meatless Mondays but you could always use chicken instead of eggplant if you wanted a protein source! Preheat oven to 400 degrees F and line baking sheet with parchment paper. Brush cut sides of squash with olive oil and season with salt and pepper, to taste. Place squash (cut side down) onto baking sheet and bake for 40-50 minutes, or until tender. Remove from oven and let cool. Using a fork, scrape squash into strands. Coat eggplant with salt in a colander and let sit for 30 minutes. Remove eggplant and squeeze out any excess liquid using a towel. Place flour, eggs, and breadcrumbs into three separate bowls. One eggplant slice at a time, dip into the flour, the egg batter, and the breadcrumbs, in that order. Place coated slices onto new parchment-lined baking sheet. Lower oven temperature to 375 degrees and bake eggplant for 20 minutes. Remove from oven and cut eggplant slices into chunks. To assemble the squash boats, remove some of the squash strands from each boat and set aside in a bowl. 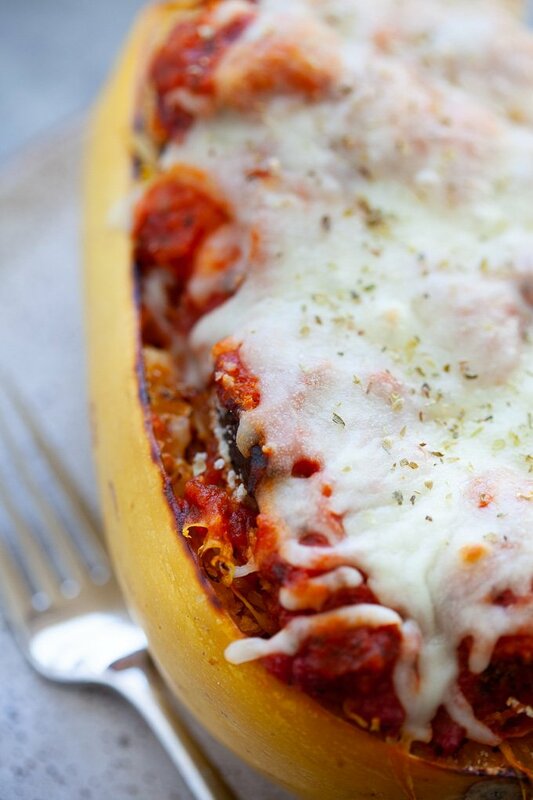 Spread a layer of tomato sauce over squash and top with eggplant. Layer the remaining squash strands on top of the eggplant and cover with another layer of sauce. Add a second layer of eggplant and top with tomato sauce and mozzarella cheese. 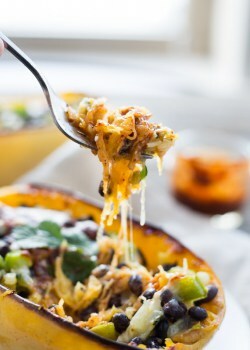 Bake assembled squash boats in the oven for 20-25 minutes, or until cheese is melted and slightly browned. 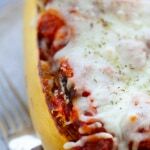 Tell me, have you ever tried spaghetti squash? 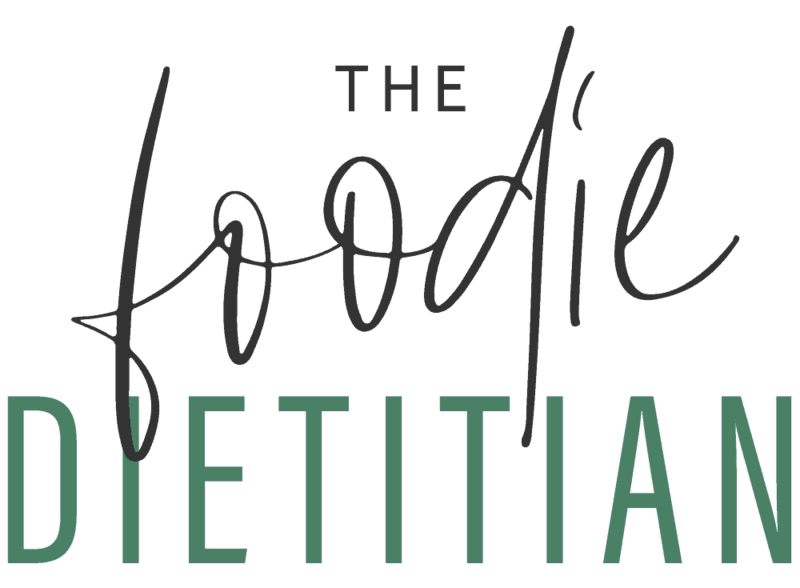 What’s your favorite way to eat it?